UK new car market down -3.4% in key plate change month as diesel and Brexit uncertainty continued to affect confidence. Major new report shows British consumers set to be among world’s first to benefit from self-driving vehicles – but ‘no deal’ Brexit threat puts progress at risk. 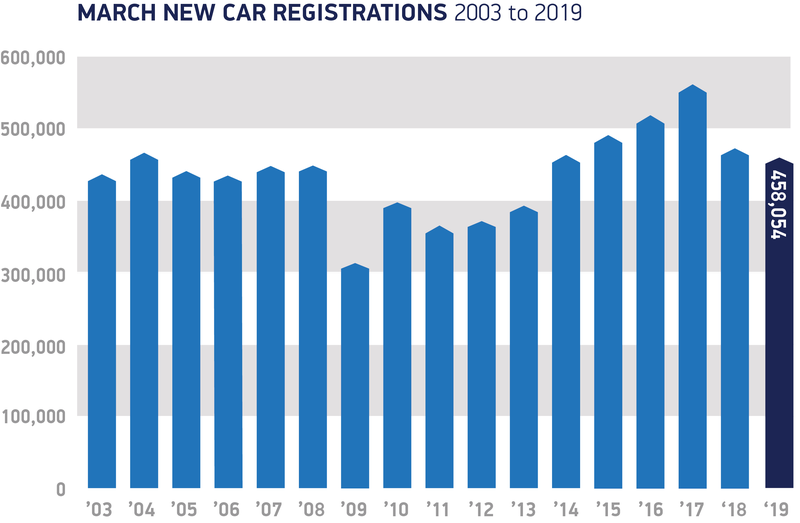 UK new car registrations declined by -3.4% last month, as political and economic uncertainty and continuing confusion over diesel affected demand, according to figures released today by the Society of Motor Manufacturers and Traders (SMMT). March is a crucial month for the new car market, as the plate change drives buyers into showrooms, with new car demand often seen as a bellwether for consumer confidence and the health of the wider economy. Demand fell in both the private and business sectors, with registrations down -2.8% and -44.8% respectively, while fleet demand was stable, up 0.3%. Declines were seen across almost every vehicle segment, including popular Dual Purpose (-1.8%) and small family cars (-4.0%). However, superminis – Britain’s favourite vehicle type – saw a 4.3% increase in demand, taking a third (33.7%) of all registrations. Following the trend of recent months, diesel registrations fell -21.4% while petrol demand grew 5.1%. Meanwhile, demand for Alternatively Fuelled Vehicles (AFVs) increased by 7.6% with 25,302 registered, the biggest March volume on record. With almost 40 plug-in models on the market in the UK, and over 20 more expected to arrive in 2019, demand for these new technologies is expected to continue to grow. Today’s figures come as SMMT launches a major new report showing UK consumers could be among the first in the world to benefit from self-driving vehicles.3 The research positions the UK at number one, globally, for mass market potential. Provided the conditions are met, the rollout of connected and autonomous technology could prevent 47,000 serious accidents and save 3,900 lives over the next decade – with an overall £62 billion economic opportunity by 2030. However, the ability to realise this is dependent in part on the UK leaving the EU with a deal that benefits the automotive industry. A ‘no deal’ scenario would have a devastating impact on investment and our hard-won reputation – risking the UK’s position as a leading global market and a centre of excellence for innovation. March is a key barometer for the new car market, so this fall is of clear concern. While manufacturers continue to invest in exciting models and cutting-edge tech, for the UK to reap the full benefits of these advances, we need a strong market that encourages the adoption of new technology. That means supportive policies, not least on vehicle taxation and incentives, to give buyers the confidence to invest in the new car that best meets their driving needs. Above all, we urgently need an end to the political and economic uncertainty by removing permanently the threat of a ‘no deal’ Brexit and agreeing a future relationship that avoids any additional friction that would increase costs and hence prices. Latest autonomous technology vehicle content analysis conducted by JATO Dynamics based on SMMT new car registration data for 2018. 1.8 cars newly registered in 2018 came with Collision Warning Systems either as standard or as optional cost extra. 1.3 million cars newly registered in 2018 came with overtaking sensors or adaptive cruise control either as standard or as a cost extra.